The striker, a position judged on one criteria. Score goals and you’re an instant hero; fail to do so and life on the pitch can become very difficult. The capricious nature of this position comes with the territory. Consistency is what separates the good strikers from the great ones. A young, Swiss forward has been quietly making a name for himself in the Bundesliga this season as he looks to prove himself as one of the great strikers. In his debut season in Germany, Josip Drmić managed 17 league goals in 33 appearances for 1. FC Nürnberg. A fantastic return for any forward, but for a fresh faced 21-year-old in an unfamiliar league, it was a somewhat remarkable campaign. A Swiss national of Croatian descent, Drmić made his way through the youth ranks at FC Zürich in his country of birth. He possessed speed, nimble movement and an eye for goal. On his debut season for Zürich II he scored 13 goals in 23 league appearances which almost instantly earned him a promotion to the first team. After settling into life with the Zürich first team, Drmić managed to make his mark during the 2012/2013 season in the Swiss Super League where he scored 13 goals in 31 league appearances. His performances were beginning to attract the attention of clubs across Europe and he eventually made the move to Nürnberg in July 2013 for an undisclosed fee. His impact was almost instant as he finished third in the Bundesliga goal-scoring charts, just behind world class players such as Borussia Dortmund’s, Robert Lewandowski (20 goals) and the sought-after Bayern Munich forward, Mario Mandžukić (18 goals). He left players like Marco Reus, Adrián Ramos and Stefan Kießling trailing in his wake. If you consider Nürnberg spent the entire season fighting for their life at the foot of the Bundesliga table, his 17 goal haul becomes even more impressive. Ultimately, Der Club couldn’t survive and were relegated from the division, thus attracting the watchful eye of clubs around Europe who would look to cherry pick the best players from their squad. Most notably, Nürnberg’s Bundesliga rivals Dortmund and Borussia Mönchengladbach as well as Premier League side, Arsenal. 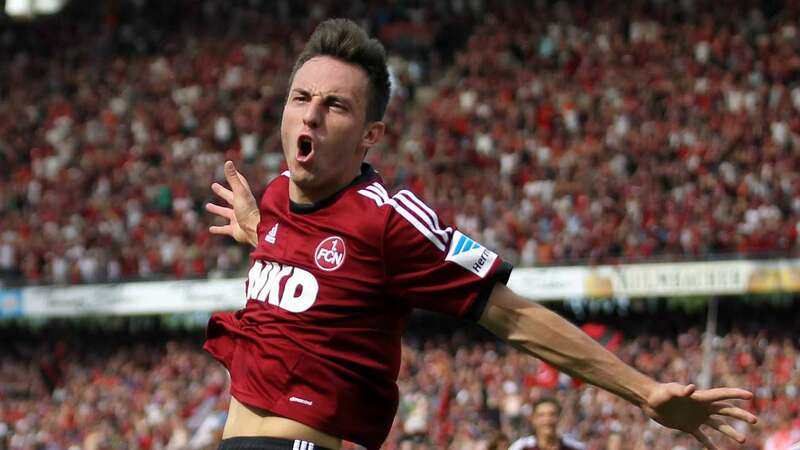 German national newspaper, Bild reported that Arsenal had expressed an interest in Drmić earlier in May 2014. Arsenal’s lack of squad depth, especially in attack and Arsene Wenger’s knack of signing young player, made a move to the Gunners seem like a real possibility. German football legend, Lothar Matthäus also added credence to the rumours as he told Sky Germany that Arsenal was the most likely destination for Drmić. Drmić is clearly a big part of Leverkusen’s future plans as the club show a clear intent to improve their performance in Europe, especially after last seasons exit from the Champions League in the round of 16. “From the beginning I had the feeling that this club suits me, I like the style of play and there are many young players in the team. “The first meeting with sporting director Rudi Völler was impressive.” Drmić continued. Völler’s influence on the young forward is clear to see and shows just how well respected and revered he remains in the modern game. In Bayer Leverkusen, Drmić could have found the perfect fit for him after a remarkable first season in the Bundesliga. It will stand him in good stead to remain in Germany as he looks to grow and develop as a player rather than jump ship to another foreign league so soon and have to adapt all over again. Drmić has proven he has the qualities to do well in the Bundesliga and Leverkusen will provide him with the next level of competition in the Champions League. It could turn out to be the perfect platform to further his development. The World Cup is just around the corner and the timing of the transfer is key. Drmić will not have the shadow of an uncertain future hanging over him during the summer, which will allow him to focus purely on his performances for the Swiss national team in Brazil. Although, Drmić has little senior international experience (only 5 caps to date), he has a far better goal-scoring record than compatriots Admir Mehmedi, Haris Seferović and Erin Derdiyok this season. This gives him every chance to nail down a spot in Ottmar Hitzfeld’s starting eleven alongside other exciting, young players such as Xherdan Shaqiri and Granit Xhaka. The young strikers’ continued development has earned him the transfer to a bigger club and Leverkusen’s early move to sign him is testament not only to his goals, but his consistent performances for Nürnberg. Drmić will now be able to concentrate completely on the World Cup and show everyone exactly what he is capable of. He’s definitely on the list of exciting, young players to watch in Brazil. Can he become one of the great strikers? Only time will tell.